Usually when you first start feeding a baby cereal, they are fairly easy to keep clean, since they aren’t moving around too much. Over the next few months they start swiping the spoon and blowing raspberries in their food. It can get messy in a hurry, for everybody! I know this can be overwhelming and letting them get messy may seem like more work than it’s worth. Some parents I work with feel like it’s neglectful to let their child sit there with food all over them, even if it is during the meal. I am here to say, throw out the towel (literally) and let them get messy. Let the food get on their hands, in their hair, and all over their face (and don’t make any disgusting faces while they are doing it). Here are four really good reasons why: You are looking at a picture of Sam (who is now nearly 3) while he was in the middle of eating his prunes around 7 months old. I know he is very messy! I hope that you have pictures of your babies covered in their food too (I actually have ones worse than this). But, I fear that many of you don’t. Are you a face scraper? Don’t want to mess up that cute little outfit? Hey, I know where you are coming from, as a classic type-A personality myself. Thank goodness my years as a therapist primed me for all the messy moments I have with my own kids now. Recently, we were at a party and while I was feeding Isaac a friend with a baby close in age to Isaac walked by with his mouth opened and said, “Oh my gosh, You let him get messy like that? You let him feed himself?” Before I respond, I look back at Isaac and observe that he has his entire hand in the container of applesauce he is eating and that it is smeared on his ear and the side of his face. In his other hand, he has a noodle from the pasta salad, I had several on his tray. It is funny because I had just been looking at him, but I don’t even think about the mess, even at a party. Isaac was having a great time and was eating so well (something he doesn’t always do). He was taking that pudgy little hand with applesauce all over it and putting it in his mouth! I gave our friend a very watered down response to why you should let your baby get messy, he was in the middle of hosting his daughter’s birthday party. This got me thinking of all the friends and families I work with and how many times I have had this discussion. 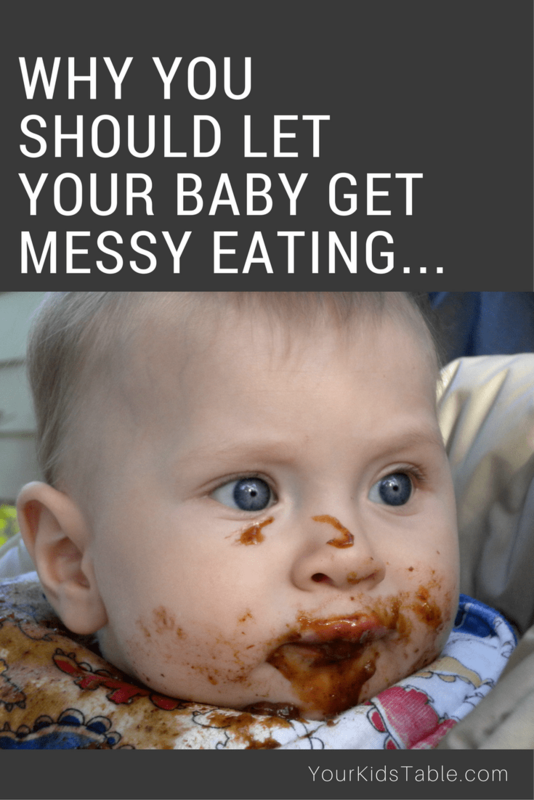 So, I thought it warranted a post, because it is very important to let your babies (and kids) get messy! Read on to find out why and how you can take baby steps into tolerating the mess (and hopefully embracing it). Meal times with babes are about more than eating. Besides learning all sorts of social and cultural norms, it is some of their first active sensory play. Think about it, you can’t put your 7 month old in the sand box or use finger paints because they will eat it. The tactile stimulation you get from playing in messy textures provides loads of meaningful information to the brain that children process and create more sophisticated responses to. Babies and children will actively seek these experiences out as part of curiosity, discovery, exploration, and the drive to experience sensory input. When babies get their hands messy in the baby food, it will eventually dawn on them that when they put their fingers in their mouth they get some food. A light bulb will go off, “Hey, I can feed myself”. It will likely be months before they are spoon feeding themselves, but those early tastes from their own fingers will set the groundwork for this skill and they will likely accomplish it much sooner! If your baby is getting messy and not putting their hand up to their mouth when it’s covered in dinner, take your hand and show them how. When kids aren’t exposed to different textures, they can become sensitive to new or different textures over time. If you keep your baby very clean during meals, they may reach a point when getting messy feels uncomfortable because it such a foreign sensation to them. This is not to say that all tactile defensiveness is taught, mostly it is not. Kids that are born tactile defensive will show signs early on as a baby. The constant wiping with a spoon or napkin to keep the baby clean can actually be more uncomfortable for them. If you have been following this blog then you know how much importance I place on keeping mealtimes positive (check out my series on this here, here, and here). 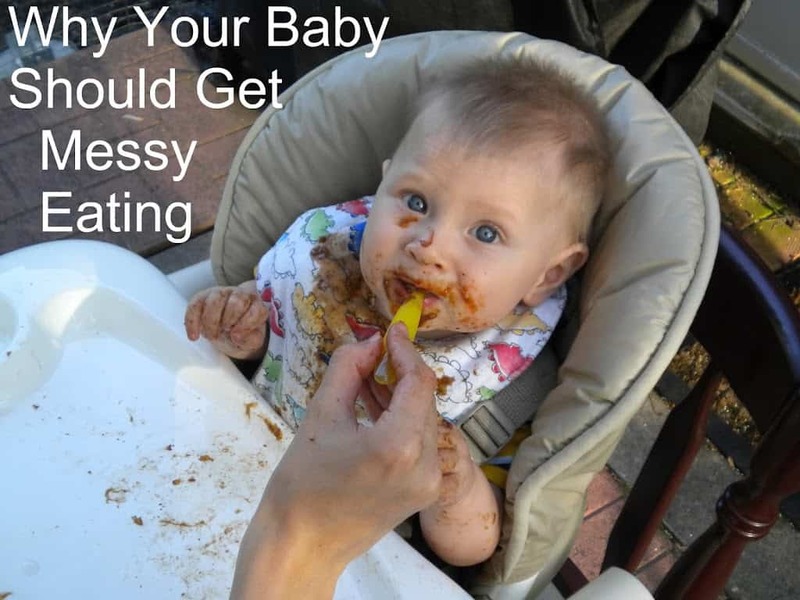 Letting babies get messy keeps a more laid back flow to the whole meal and thus is more positive. If you are fighting with your baby so they don’t grab the spoon or trying to pin them down to wipe their face off after each bite, meal time might not be so positive for baby. If you wipe your baby’s face constantly or don’t let them help feed themselves, you are depriving them of a wonderful learning and sensory experience. Sorry, I know that sounds harsh. The good news is that it’s not too late to let them start to get messy. As they creep into life as a toddler, you do have start teaching table manners and it may not be a great idea to let them squeeze and slop their food around just for the sake of playing. But, if they are getting messy just from the act of eating than let it go and while they are younger toddlers a little of the messy play is ok as long as it isn’t too distracting. If you notice your toddler is trying to play with their food a lot, provide them with opportunities to finger paint and play in various sensory bins. Taking the spoon and scraping the food that has dribbled out off your babies face. This can be so uncomfortable or irritating. Let the mess be! Wiping tray off frequently. If some mess slops on the tray let it go unless it is interfering with finger feeding. Letting babies slop the mess around with their hands is wonderful sensory play! Allow your baby or toddler to get messy as long as it doesn’t interfere with their ability to see (they wipe their eyes with a messy hand) or feed themselves. Wait to the end of the meal to clean up. If your baby doesn’t like getting cleaned, try to take them away from the high chair so they have the positive association from the meal not the getting cleaned up part. Consider giving the baby their bath after a particularly messy meal. Most babies love bath time, and it is often the easiest way to get them clean. Was that a good sales pitch? 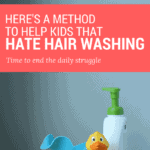 Did I win over any other neat freaks type-A’s (like myself) that want their kids to be clean? If I can do it, so can you! Embrace the mess! Feeling inspired? 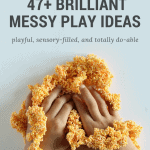 Head to my epic list of Messy Play ideas that are easy and awesome for your child’s development! Ultimate List of Sensory Bin Ideas, Incredibly Easy! I am so happy I came across this blog! I literally googled “what is the purpose of letting a baby play with their food” and found this. So informative! I would see pics of kids with spaghetti everywhere and think, why??? I am totally the mom you describe – type A, always wiping baby’s hands if she hits the spoon (she doesn’t like it). I am going to stop now and clean at the end of the meal. Thank you for this! I do seek some advice though. My daughter just turned one recently and the only food she will pick up and eat is puffs and teething crackers. Any actual food, she plays with, pushes into her lap, or throws on the floor. I have not yet tried something messy like spaghetti, but after reading this blog I did let her play with some yogurt on the tray. Green beans or fruit, she doesn’t ever put it in her own mouth, but she will gladly eat it off a spoon. I have tried showing her. I’m just not sure how to get her there…. she’s been eating puree’s and some table foods off a spoon for so long, I was thinking she just didn’t understand, but then again… she feeds herself the puffs and crackers. I’m so confused. I am going to keep trying anyway. Oh my gosh, I love this comment, and your honesty!! You’ve actually left this comment in just the right time. 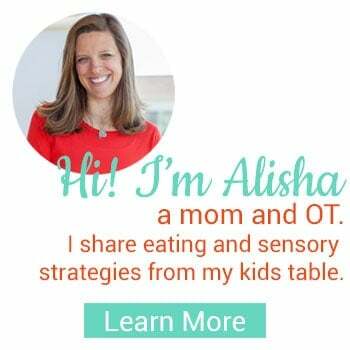 Did you see the new free workshop I have coming next week on teaching your baby/toddler to eat table foods? It would be perfect for you guys! You can grab a spot here. In the meantime I’d focus on letting her get messy, and crunchy foods she can pick up more easily! I tried this with my first son when he was an infant but he immediately got contact dermatitis from the food, then rubbed his eyes which got puffy as well. He is 3.5 years old now and a very picky, fussy eater despite all my efforts to make food tasty enjoyable. 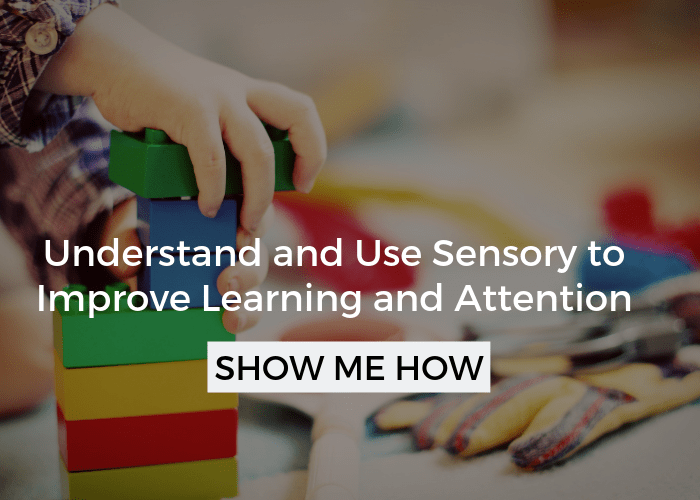 I agree about the importance of sensory experiences, especially for my second child’s who is a 7 month old with complex special needs and global developmental delays. I know that it could be a great motivator for him. I just hope he won’t have a bad reaction as well. Thanks for sharing your story, I hope he doesn’t either:) I’d take it slow and keep a washcloth nearby. Also, wondering if there were any food allergies to the foods he was playing with? I want to but I just can’t deal with the mess right now. I’m exhausted 24/7 and have a big house to keep clean and running around with my son. I just can’t deal with every time he eats he’s a mess. It’s too much work having to change him or bathe him too many times. I don’t have the time for this. I try to let him eat on his own but not messy foods I just can’t. I know I will judged but I do let him feel different textures all day but can’t deal with the huge mess of foods. My daughter is 8 Months Old and loves eating her solids. Now shes grabbing the spoon from me each time. What am I supposed to do? Thank you! I like to give the baby her own spoon and bowl to use while you use a different one to help feed them with. Hey Alisha, first time dad here. we have a 9 month old who never really showed any interest in solids. we have to trick him in to opening his mouth so we can shove in food. anyhow we are trying all sorts of things and i just read this article. i’m onboard with your plan to let him make a mess. how many times a day would u recommend us doing this? we want to get him to eat 2-3 meals. should all of them be messy? do we need to bathe him that many times? Great question Dan! If it were me, I would let him get messy at every meal. However, giving him a bath after each meal could be a bit much. Maybe just have him eat in his diaper and clean him up with a wash cloth. Also, have you my post on When Babies Don’t Eat Solids? I apologize if you have already addressed this, there we’re too many comments for me to read. I needed to read this! My son is almost 13 months and has very little interest in eating. He is breastfeed and never took a bottle but my milk supply is low so he hasn’t gained very much weight over the last 5-6 months. He is VERY independent and won’t allow me to feed him so I’ve started letting him “feed” himself. He struggles with table food because he has so few teeth. I am giving him baby food but there is very little eating taking place, just lots of play! I recognize that it is beneficial play but can I expect him to begin to eat more as a result? Am I teaching him that food is for play rather than eating? What you’re doing is great! I’d help feed him though too so he’s getting some food. Also, keep in mind, babies don’t need teeth to eat most foods, their gums are highly efficient! I am slowly doing it with my bub. He is 10 months old now. We went to a BBQ with friends and a lady was freaked out about our bub playing in the dirt and getting all covered in food. She has always kept her kids neat and clean and they now suffer from various allergies, whereas mine is all healthy and fine. I needed this! I was starting to question my abilities as a mother! My biggest struggle now is managing how to clean up the mess! Thanks! I love your blog! Oh no! I’m so glad you found it! I love looking at these kinds of photos! The only thing that makes it better is when they are wearing a onesie that matches what they are eating. For example, if there is a baby eating peaches, the onesie could say something about eating peaches and cream. Those are the best kinds of baby pictures! Thanks again! Really needed to read this. Had planned on baby led weaning (skipping purees entirely) but it simply didn’t happen they way the book said (HA! what does?) I actually don’t mind the mess at all, but Little Man HATES being cleaned up after. He likes the bath, but hates when I have to actually WASH him. I have been afraid I’d create a bad association. Then we’ll play in the bathroom a few minutes before bath time. LOVE this Erika!! Thanks for sharing your plan, it will surely inspire others! Yay for embracing the mess!!! Thank you so much for sharing that Nana, that’s so helpful for other’s to read. What an awesome grandmother you are! Very nice breakdown. This seems obvious, but sometimes we need a reminder. I believe that self feeding is particularly important. Great advice all around. I wish I read your info before. My little boy is 20 months & out of high chair since 17 months (to big table). I’m struggling with the mess & more Than anything keeping him one place a minute. I’m very worried he is not getting enough nutrition. Hello, thank you very much for your articles, I find them really helpful. 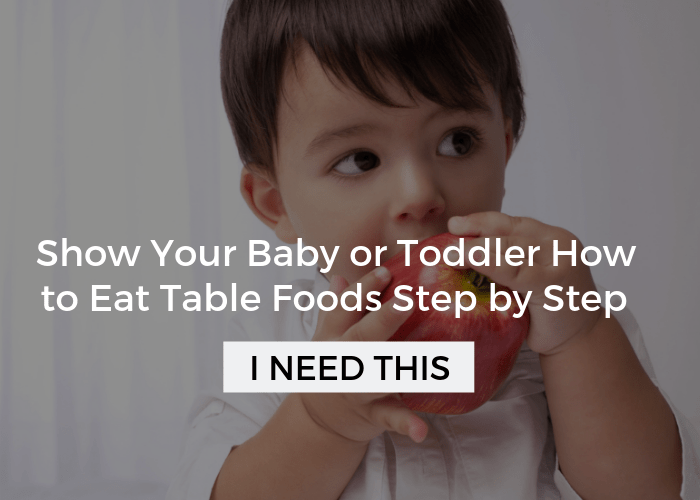 I was wondering – do you think the “no sitting, no solids” applies to all babies? My son was born three months before the due date. I was advised to start solids fairly soon, mainly because of low nutrient stores in his body (which are normally built during the last trimester). Particularly his iron level was low and his iron supplements gave him severe constipation. I waited a bit more than the doctor suggested and at around 5-6 months corrected age (i.e. 8-9 biological age) i introduced solids. He is now 8 months corrected age and still not sitting by himself. I would love to let him self-feed but its difficult to find a suitable position. On the other hand, waiting for him to sit first would mean waiting for 2 months more (guessing), so he would be almost one year old at that point with no solids. This just does not seem right to me (from nutritional view as well as in order for him to get used to different food than milk). He shows BIG interest in food, in us eating, in us drinking from cups. What is your opinion? Are you convinced he should not be on solids yet? If not, is there any position you would recommend for safe eating (and self-feeding?) in a non-sitting baby. Thank you very much. Greetings from the Czech republic. Eliska- this is such a good question! Although I don’t have “my eyes” on your child, what I would typically suggest is starting feeding, as you mentioned. This is an instance outside the norm for sure, and there certainly are exceptions. I would recommend making sure he is seated in a well supported high chair, and in an upright position as much as possible. Keep your doctors informed about how he is progressing and swallowing well. Hope that helps all the way in the Czech republic! I just started my 6 month old on cereal. I wish I had started with banana or avocado (maybe next week!). Should I let her stick her hands in the bowl and feed herself? It sounds like this is what you are recommending, but I wasn’t sure because I didn’t start with a finger food. I think she would rather do it herself, so I’m going to give it a try. Any tips? Even though I understand it all and see nothing bad about it it isn’t fun for everyone. Sleep deprived and always busy with their child parent may want to avoid extra messiness as they already have plenty to do and their energy after bad nights is limited. That’s why I understand the wiping or even getting upset when they have to wash their child. Every child and parents situation is different. Sometimes parents are just falling on their face of tiredness and would want to be more relaxed and not as tired but are mostly or totally on their own. That changes the perspective drastically. Your entry has enlightened me so much! I started feeding my son his first solid food when he was 6 months old and being particular about cleanliness, all prim and proper, I tried my very best to wipe and wipe and wipe his mouth for even a morsel of food. Yay! 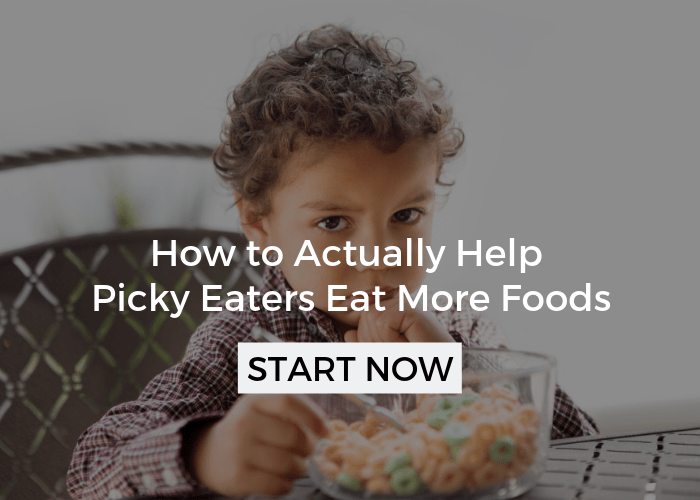 Welcome Hilliyah, click the top bar on the screen and sign up for feeding tips- there’s a great printable that you’ll really like, too! I haven’t had time to read all the comments, so I hope someone hasn’t already asked this (apologies if this is a repeat). My boy is 10 months old. 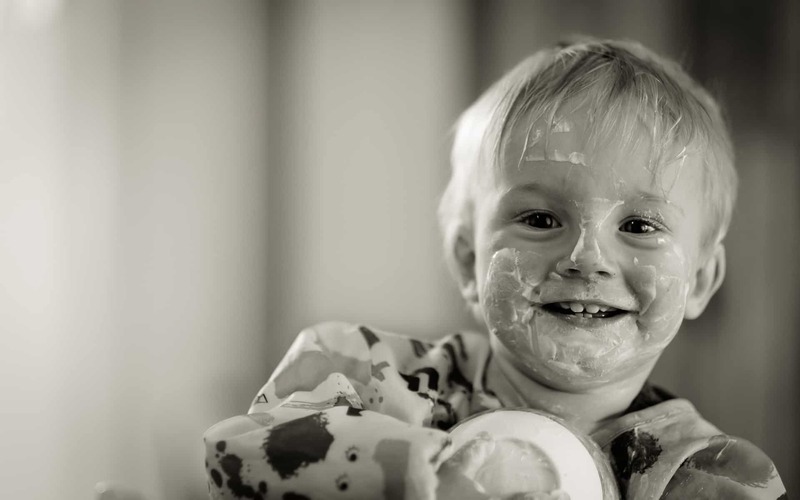 We started with purees and yoghurt from about 6 months old – lots of spoon feeding (and face wiping). For a while, he seemed to accept most food we gave him, and I started giving him small pieces of stuff (cream cheese, soft cheese, scrambled egg, veggies, fruit, etc.) to chew on and try to eat. But I’ve always been a face wiper, the mess really gets to me!! Anyway, this past week he’s starting to refuse all the food I give him. He won’t touch fruit, which he usually loves, he won’t eat anything, just pushes it out of his mouth and gags a lot of the time. He *seems* to eat at daycare (his food is mostly gone when he gets home, so I hope it’s him eating it), but at home, he’s only drinking his bottles, mostly when he’s tired at bedtime. Did I ruin him for food with the face wiping and tidying? Can I bring back his enthusiasm for food? He was so good with it a few weeks ago, he’d try anything! Now, he refuses everything, it’s driving me mad! Do I need to get him help? Or shall I just let him have at it and make the mess he needs to to enjoy the food? How do I make sure he gets enough to eat if most of it ends up on the floor or in his hair? You didn’t ruin him and babies and toddlers go through all sorts of phases for different reasons. Help is never a bad idea. I would definitely let him enjoy the food and make a mess, he needs that and I think that is what he is indicating. I know its hard but it will be worth it, I promise. Right now it doesn’t matter how much he eats because he is still getting milk as his main source of nutrition. Take the next week to apply no pressure, but you can still offer to help. Let him go at it and get back in touch and let me know how it went. I’ll let you know if I think he needs more help! Since we are focusing more on Liam’s sensory needs rather than a GI issue at hand for his inability to eat anything other than Pediasure, I needed to read this post! My husband is worse than me about letting him get messy – so that is tough! However, we will do it! He needs the sensory and the confidence to feed himself. Oh my goodness, yes, I know it’s hard, but with what you just told me in the other comment this could make a huge difference! Wishing you the best! This is such a great post!! And I have read many other posts from you regarding child’s eating habits, must say very informative. Thanks so much Bini, it is such a common mistake, don’t beat yourself up about it! I would get him started in sensory bins, this will be very helpful. I have a post on how to set up sensory bins, what they are, and why they help (see the article index in the menu bar, scroll down to sensory). 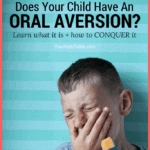 I have another post called Sensory Processing and Picky Eating, I think that will be very helpful, too. If you have any other questions, please let me know! Our first child was born in September 2012. I happened upon this article as she was learning to feed herself and good thing! I was pretty OCD about messes, but gave it a shot and haven’t looked back since. Our daughter was messy, but all I noticed was she was HAPPY! Of course, she may have inherited some of the cleaning OCD anyway – she learned to clean herself and cleanup after herself without prompting from me, but when eating those most favorite foods, she still throws caution to the wind and makes a mess. I recently had a friend confess she constantly wipes up after her baby, so I shared my story and this article and inspired her to set her son free, which made for a very happy mama and baby. Thank you for the inspiration, that motivated me to put my unwarranted fears aside. Oh Susie, thank you so much for taking the time to write that and to share it with a friend!!! That made my whole day! Many props to you Mama, you are doing great!!!! As a mom of three young boys, one being 10 months, who feeds himself a lot of food, I totally understand. The point of this article is not to guilt you into letting your child be messy, but to inform you of its importance. If it isn’t right for your family that that’s okay. Just be aware of those warning signs for sensitivity to textures, which only sometimes happens when kids don’t have a chance to explore foods. This is a great article! I’ve been letting my 11 month old get messy in her high chair. Definitely easier to clean up when she’s just in her diaper. He is really young and it sounds like you are doing an awesome job! He is right on track, as the lack of food actually getting into his mouth is very normal. Keep helping him and showing him. As he improves pull back and allow him to do more. he is all of the sudden doing it 😉 mommy is happy now , as a first time mom sometimes i find it hard when i don’t understand what he wants but i am realizing that the changes come so quickly , when i least expected i see a result!!! he is now eating his food and playing with it it a bit less he loves the sensation of the textures and to spread it all over the table 😉 but he does it more once he’s had enough ;), Thank you once again. I love this info, Sometimes i let him (15months boy ) to get big mess. I really need tips “he hates sitting on chair while eating.” So i let him eating on the floor n it takes 3-5 mins. After that he will walk around n pinch his messes food on floor. My little boy is 18 months old and I doingvery well at feeding himself off a fork or spoOn. I don’t mind mess and I don’t think I have ever discouraged it but if he gets food on his hands he gets upset and won’t continue with the meal unless it is wiped off. The problem is he now is very fussy with exploring new things. He won’t touch sand and freaks out if he falls over on the grass. I have no idea how to encourage him to get messy. He also refuses to wear a bib..
See my post on sensory bins- I explain how to overcome this in small steps. You can find it in the article index in the menu bar under the heading Sensory. The key is to try dry textures for play first and be encouraging and slow. It will take some time. Let me know if you need more help! This is a great article! Thanks for sharing your thoughts. Unfortunately, I did not let my daughter be messy and play with food. She is 3 years old now and does not want to feed herself. She asks to clean up her hands as soon as she gets some food on them. I wish I could go back in time and implement your thoughts when she was little. I know it is my mistake and really hope it is not too late to fix this. Would appreciate any tips to sort this out for my 3 year old. Give her a wet washcloth to wipe her own hands off- it is okay if she needs to do this. I would get her started in some sensory bins to break down any sensitivity she may have developed. See the article index in the menu bar for the link. Set up messy crafts and encourage, but don’t force her to interact with the materials. I was thinking to do the same thing the other day, but then I realized I didn’t want to have to clean a shower curtain every mealtime either… Seems easier to clean the floor, to me. Instead I recently started using newspaper or those grocery store ads that come in the mail. I put it under the high chair to catch all the mess and then wipe the mess from the high chair off the tray onto to paper and then throw it away! So much easier! I was wondering if you have any suggestions for clean up. Also, do you put them in just their diaper? My issues is that she gets it all over her outfit and then I need to send her to day care etc. Also, any easy ways to get it out of the hair especially if it is during breakfast or lunch and you still have the rest of the day before bath time? I think the diaper is great. Unfortunately is some clean up, but it is worth it. I just use a wet washcloth and wipe out as best I can. This really messy phase will pass before you know it. Hi! I just want to share about Adjustable Silicone Baby Bib – this BPA free rubber bib is very stylish and environmentally friendly and can safely be washed in the dishwasher. It protects baby’s clothes and is very easy to clean. You can buy this kind of Silicone Baby Bib in this site http://lemikdk.com/baby-child/. Not at all! I know it is hard, but go ahead and let her start to get messy! See the Eating Basics tab too to help with her selective eating. You need to have a good bib with that messy eating. I use the silicone bibs because its really easy to clean. Have you tried this type of bib? Just found this blog a few weeks ago, so much great info! As a first time mom and COTA I have mad respect for your insight! Thank you so much, that comment made my day! I am a first time mom and my son is turning 1 next month. I feel like I am really behind on teaching him because he only eats snacks by himself and he doesn’t do the pincer grasp he just shovels food into his mouth. I am so overwhelmed and confused about switching him off of baby food and formula and i never let him eat by himself or get messy, should i just give him baby food to eat with his hands? I am trying to figure out how to get him to eat with a spoon by himself and I feel like I am way behind. I am sorry for such a long comment, I am just so overwhelmed and I am not sure what to do! Hi Shayla, I’ve got you’ve covered. All of the areas you mentioned I’ve written about already with clear directions. Click on the the article index in the menu bar and scroll down to developmental milestones, you will find it all there. In the mean time the best thing you can do is relax, if you still have more questions let me know. Also, if the strategies don’t seem to be working and you live in the states it would be great for you to access your state’s free in home evaluation. See the article Help for Infants and Toddlers also in the article index. very useful info, i used to constantly clean up my son up to 18 month and he doesn’t feed himself still we didn’t give him any chance to pick up food -(. too busy working and didn’t realized all these useful tips until now. Don’t worry about the choices you’ve already made, he will be just fine, especially now that you know to let him get a little messy! Good luck! Sometimes we use two spoons so that she can practice with it and I can feed her (she’s 9 months). My husband teases me about how messy she gets when I feed her, but I don’t mind. We live in a smaller apartment and it’s got wall to wall carpet. I would love to let my son (14 months now) feed himself since it’s such a fight sometimes and I’m at my wits end, but we can’t afford to have him stain the carpets, and also if he starts flailing with food on a spoon, or all over his hands, he’s gonna get it all over our computers/desks/tv/other such electronics. I don’t know what to do. Please help. BTW, he doesn’t eat much of finger foods, and since we don’t know what to do with him, we still spoon feed him pureed stuff mostly. oh and another thing, once he gets too annoyed with eating/not eating, all he wants is his bottle. i wish I could wean him off of those too. Your welcome! Hope it goes over well with Dad! I don’t let my baby feed himself because it gets messy and I hate having to clean him up and change his outfit after every meal. Plus, he’s just not good at feeding himself because he doesn’t have the coordination to do it at his age. Eventually he will be more coordinated and it won’t be such a mess, and at that time I will let him feed himself. Of course, that is your choice Elisa. Like I said in the post, I know it is difficult for some parent’s to tolerate the mess, but there are benefits to it. I have bad ocd andcthe thought of mess makes me physically sick usually. but I want what’s best for my boy so am gonna hold off the DEEP clean until after. thank you! Oh my gosh i wish there is a chinese version of this! My husband’s parent are so OC in feeding they wipe her mouth in every spoon feed! Ha ha- I think there is a way to translate, some how. Good Luck! Absolutely agree, our son was allowed to get as messy as he liked and we didn’t clean up until after. He was a great feeder, very self sufficient and early with utensils. BUT – just after 12 months he suddenly got really fussy and stopped eating most of the foods he used to love. We thought it was a phase but he’s now 2! He’s very good at self feeding, cereal, toast, fish fingers, yoghurt. But how do we get him to eat different foods? It’s not totally uncommon for this happen because taste buds change. I have a ton of info on expanding variety- it can be a slow process. See the article index in the top menu bar. Look for the posts on Expanding on What Your Kid is Already Eating and Play with Your Food. Let me know if I can be of more help! Thank you so much for that article. I am a mom of special needs child who spent many first months in hospital and now home with a trach. He is now almost 3. It is hard to allow him to get messy, worry about trach care and cleanliness. He also has had a lot of eating, chewing, swallowing issues and sensory issues, touching different things. after reading your article I think the missing link is allowing him to play more with messy foods on his hands and hopefully he’ll stick a finger in one day instead of me and OT always trying to jam it in. I am so glad I found your blog. I’m really glad you found your way here! I understand about the trach, and it is a legitimate concern. I’m wondering if there is someway you could protect it without it aggravating him while he is eating? But yes, letting him get messy is really important. I would think about sensory bins and finger paints, too! Let me know if I can help at all! I definitely needed to hear this. My son loves to explore his food! It’s so hard not to wipe! Thanks so much for setting this straight. I hate the fact that I was depriving him of sensory play. I absolutely adore your blog, and teachings. Thank you for taking the time to share your knowledge. Thanks so much Kate! If I wasn’t an OT, I’m sure I’d be the same way! My son loves to feed himself, and at 10 months he gets most of it into his mouth.. However, what he didn’t wound up all over his new clothes 🙁 To contain the mess, check out these towel bibs I made! Our son never got messy eating, mostly because of what we let him feed himself (no liquid/puree/gooey/sticky stuff), but he grasped the whole utensil thing pretty quick and thankfully got most of his food in his mouth from the start, which was great for me because sticky children make me crazy, and by that I mean kids who get to be messy and play with their food, but then are not cleaned up after, and parents leave them covered in goo. 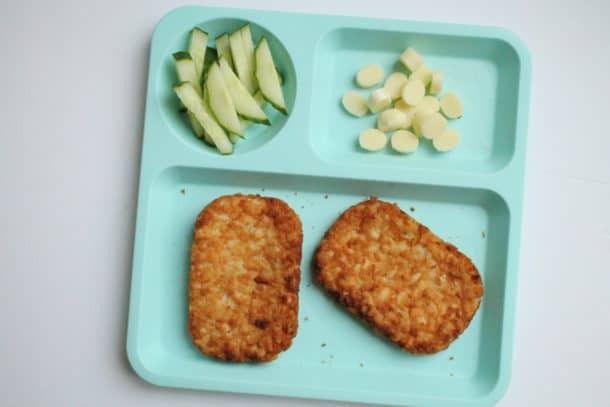 I do understand the sensory aspect of letting kids self feed just about anything, and I know plenty of parents who let their kids go nuts with food. We made the choice not to go that route. But we also didn’t wipe his face until the end of the meal. We didn’t go crazy about it. He’s a kid after all, and messes are part of life, as much as it pains me to say that 😉 People, the ones whose kids were always covered in gunk, were always amazed at how clean our boy was. That was also due to the fact that we rarely bothered with a regular bib, and used kitchen towels instead, to cover him from neck to toes! That was more about how I didn’t want to have to change his clothes 8 times a day. It worked, we had almost no food stains on clothes! In any case, back then he ate well, ate a huge variety of foods, and now at age 6, he’s still a great eater, loves just about anything he tastes, has no sensory issues and enjoys getting dirty as much as he enjoys cleaning up and washing! I honestly think there is a balance to be struck here, when it comes to the sensory matter and there are many other ways to allow children to experience textures, to show kids that getting messy can be fun. Mealtime can be laid back and fun without wasting food, creating huge messes. Anyway, the un-messy style worked for us, but our son definitely knows how to have a good time in dirt, mud, slime, etc. CRC, thanks for your constructive comment. You bring up some valid points. I by no means meant to imply that every child that had their face wiped would have sensory issues and be a poor eater. I am glad that you found the balance that worked for your family and that your little guy is such a good eater. My hope is that parents can go a little out of their comfort zone so that kids are free to explore (a little at least)- that is what they are designed to do. Of course, I respect each parent’s decision in how they handle this. I don’t mind if babies get messy naturally but I’ve seen people PURPOSEFULLY give them a bowl of spaghetti just to watch them smear it all over the place. Kind of don’t understand that. THank you so much!!! I am a first time mommy and am constantly wiping his face to keep it clean. We will be getting messy from now on!!!! My son loves to eat and for some reason now, he fusses when we put him in his high chair. He seems not to like baby food, he wants what we are eating. Any suggestions? So sorry Susan- missed this comments some months back now. I’m sure you’ve moved passed this stage- let me know if I can be of any other help! I’ve come across your website after searching for some tips on my picky 18 month old. I just love it! I let him get fairly messy wen he was younger (I have some stunning pics, lol) but I’ve reined back on the messiness since he started waving the spoon about (my hubby’s fault – he insisted on cream walls in the kitchen, lol) but I think I’ll be trying to reintroduce it as we’re having real problems trying to get him off of baby food! I agree about the messy eating. My husband on the other hand is a neat freak. Our son is only 3.5 months now,but I can picture my husband with the bib or cloth ready to wipe our son after every spoon. My only concern is the expression on my parents and in-laws when he starts putting the food all over his face. Maybe I should take a picture of my parents’ expression when that happens. I’m sure that would be priceless. Really enjoy your blog. I’m also an occupational therapist. I realize it’s easier to tell clients why you’re doing things than your relatives and friends. I had to laugh at your “messy” picture. Mine were tidy if there was nothing behind their ears. They started self feeding at 7 or 8 months. Beet purée and yoghurt was quite a site. But the mess lead to skills. Awesome points! I did a pretty bad job of explaining to friends at dinner why I’m ok with letting the 15mo messily feed herself. Now I’ll be more prepared to answer those types of questions. Out of 5 kids, only 1 was a “clean eater”. She insisted on a damp rag on her tray at every meal, and would even wipe the chocolate icing off the donut because it was too dirty. She’s also the only limited eater, preferring raw veg that’s not touching anything else for lunch/dinner. Thanks for sharing! I love it, you are totally armed next time! I love this! I let my baby (2nd child) get messy too. It’s fun for him and I don’t mind cleaning up after. I am way more relaxed about these things now that i’ve got the experience of a firstborn under my belt. Fantastic. 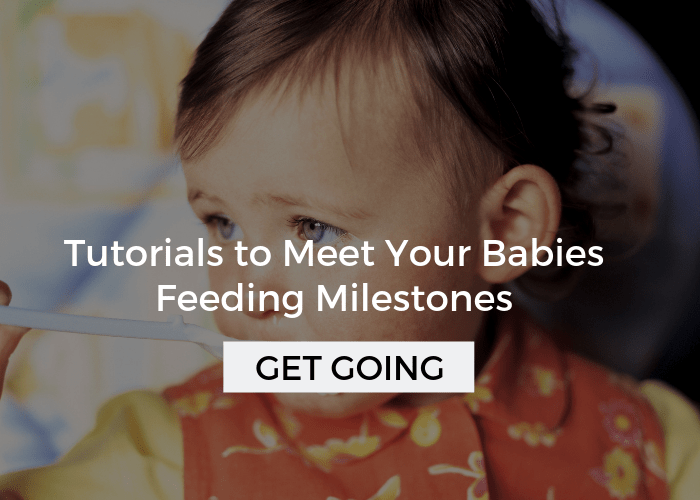 Letting babies learn to eat the messy way. Love it. Love this post, Alisha. I’m a fellow pediatric OT/mom and it has been fun to be a part of the mealtime mess with my little guy. It’s funny, I once posted a picture on Facebook of my then-11-month-old with pasta sauce all over his face, hands, and tray, and there was one mom who commented where you could tell she was kinda freaking out about it. I certainly don’t encourage him to smear food all over the place and throw it (as far as “bad” behaviors go), but I’m with you on letting them learn to interact with the food themselves and being okay with how it feels to be messy. We haven’t even used a bib since he was about 10 months old(mostly because he just tries to put all bibs in his mouth, haha). I’m passing this post along and pinning it, thanks! Thank you!!! I know the mess is really hard to for some people, but I hope this gives them encouragement to embrace it! you have been featured on the Sunday Parenting Party at Taming the Goblin, please stop by and grab a featured button from my button page if you’d like one. i was thinking about this the other day. Goblin is now nearly 3 and a reasonably clean eater but when he was a baby we used to just let him get really messy at meal times and then change his clothes and nappy at the same time after he’d eaten. I watched a programme about a child who had a fear of eating and when the therapist looked into it she discovered the mum would basically attack him with a cloth after every mouthful, no wonder the poor child didn’t want to eat. That’s awesome, thank you! I know that program sounds crazy, but it is so true! In the long run it is so much better for them to just get messy! This is a wonderful post! Thank you so much for sharing. I couldn’t agree more. I have let all four of my boys feed themselves at a young age, and I ignore the mess. Like you said, they are washable! Thank you for linking up to The Sunday Showcase. By the way I will be featuring this post on Saturday! Thank you, Allison, that is awesome! I am thrilled that you are sharing! You are so right about the self feeding. My kids were able to use utensils really early, too! That’s a great point, thanks for stopping by! My husband is an overly neat feeder (He cleans the bottom of the spoon before putting it in her mouth and wipes her after every bite! No kidding!)! I am sending him a link to this. Very good points made here! Thank you. I believe you, I see it all the time! Hope he can “embrace” the mess after reading this! Your right I do feel like a bad mother when I let him get messy, but I cant take him a bath every time he eats. Plus I am a neat freak I always want to feed him the only food he eats on his own would be food that arent liquid at all. So it wont be as messy. I see ur point of view by I wont be able to let him get messy. I dont want him to stay with does actions. Oh Ana, I know it can be really hard to tolerate the mess. Try baby steps ( for yourself) and keep reminding yourself that it is what’s best for your child when you cringe at the mess. Thanks for commenting! Lots of mess here! And bathtime right after. It’s all fun. My baby does loads of eye rubbing, even when I know she’s not tired. It’s the only part that troubles me as I don’t like leaping in with a wipe, but she’s goIng to get tomato sauce in her eyes soon. Great post – I think people have diffenent tolerances for mess. Luckily I’m pretty relaxed about it as with two messy twins there is a lot of mess. Thank you for checking out the post and hosting the link-up! Good info… but I do have a question. As a new mom, I don’t want to encourage “bad behavior.” At what age should you start to reign in the messy food play and shift their focus. Is there a risk that allowing a baby to play with their food will teach bad habits that will be hard to break later on? Of course, this is a valid concern, but I can assure you that you really don’t have to even begin to worry about this until closer to 18 months. Mainly, I want to encourage parents not to wipe faces until your baby or toddler is done eating. They can make such a mess just feeding themselves. 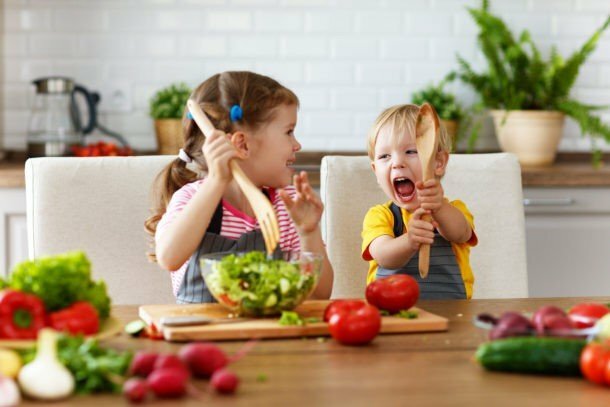 As they approach 18-24 months you can start to teach about table manners, and pull back on some of the more playful behaviors they may have with their food. Most of the time these behaviors fall away on their own, as they mature. You could also set up play time in sensory bins with food, away from the meal if you are worried about bad habits, but, again, I think it will be a minor issue, if one at all. Hello! I loved reading this article and would love to be the mom who can handle a messy kid. I know it’s good for them, but I am completely OCD about mess in general. Since my toddler is already 18 months old, have I ruined him for life? Is it too late to lighten up and let him go at it? I still feed him when it comes to the messier meals, but I would like to let go and let him do it himself. You said at this age they should be over the fun of it and should be starting to learn table manners. Should I still be doing that or let him have fun now since he missed out on so much of it? Well, he may be a bit messier if he hasn’t had the time to do that. I think it is okay to have a little fun for a bit AND NO you haven’t ruined him at all. You have plenty of time to let him get messy! You can do it!!! Thanks for the response! Those age guidelines are helpful. 🙂 I love your blog – lots of fun ideas for the future. Our little one is only 5 months old so no table food yet, but I love the ideas and appreciate your expertise. Thanks a bunch! I needed to read that…. Nothing but pure mess around here–thanks for the reinforcement that it’s definitely the way to go! That’s great, glad to hear it! my granddaughter is now five and was taught to eat that way. she is way behind other children in feeding herself at this time. my children were fed and then taught to feed themselves, however they were given soft veggies and such as treats and sat on a blanket and they could have at it. my youngest granddaughter is being taught the save caveman way as her sister. this is terrible. and no there is nothing wrong with my oldest granddaughter. she just gets fussed at for being a messy eater when that is what she was taught. ignorance. All of my children learned to feed themselves this way, my older two are 4 and 6, and have wonderful table manners that most strangers comment on. And, again, this is not ignorance, perhaps a difference of opinion. I am an experienced licensed pediatric occupational therapist that has treated hundreds of children.